One of the biggest failings over the last half century when it came to properly – and accurately – chronicling rock history was the utter lack of focus on the actual birth and subsequent rise of the music in the late 1940’s, something which has radically altered the entire story when it comes to the mainstream perception of what rock music is, where it came from and who can lay claim to its cultural legacy. The reasons for this are fairly obvious having to do with the usual culprits centering on provincialism and race, but what’s most shocking, and most troubling, aren’t the reasons why an alternate history took hold (which is all too easy to understand) but rather the bewildering lack of studious research to uncover the truth along the way. The fact that the origins of rock are so clear, the evidence of its existence so unassailable, and the examples of its widespread stature at the time in black America so prevalent everywhere you look – provided you bother looking I suppose – is what makes the ensuing seventy years and counting endlessly frustrating for those who simply want rock’s whole story told unabridged. One of the longest held fallacies is the belief that the term rock ‘n’ roll was only affixed to the music when disc jockey Alan Freed began using it on the air in the 1950’s. Sidestepping the fact that the music he was playing on those broadcasts was the exact same music, same artists, same actual records we’ve been covering to date here (his theme song was Blues For The Red Boy by Todd Rhodes, one of rock’s first instrumentals from late 1947, and the playlists of many of those shows are well documented and consist of countless names we’ve met along the way to this point), you would think it might’ve occurred to those who were promoting the so called “Freed origins” version of the story to actually listen to those records. If they’d done so it wouldn’t have been hard to see that Freed himself was hardly the first to affix the term “rock ‘n’ roll” to the music. In fact it had been called rock ‘n’ roll since the very beginning… by trade papers (Billboard magazine reviewing a Jimmy Lewis cut from 1947 explicitly referred to it as such) and most importantly (and most frequently) by the artists themselves. Roy Brown’s Good Rocking Tonight which launched rock ‘n’ roll of course used it prominently, which is one reason why it was such a crucial record beyond its myriad of other precedents. In the ensuing months others did as well from Tiny Bradshaw, Wild Bill Moore and Wynonie Harris to Manhattan Paul, Albennie Jones and Goree Carter and many, many others. It was the unifying all-encompassing reference point found in so many lyrics and acted as a call to arms for artists and listeners alike. Furthermore all of this was done with obvious intent. This was no coincidental happenstance or innocuous wording signifying nothing, but rather it was a musical movement proudly declaring its place in the world. The problem of course is that the place it was coming from, namely the young black populace, HAD no voice in the larger world at the time to make it known beyond the confines of that insular community, nor did they gain that voice in the years to follow when rock’s story should’ve been first put to paper with firsthand accounts that documented its start. Instead it was left to the second, or even third, generation who came along after white America “discovered” it to put the story into some kind of order and maybe due to the fact that nobody in the larger publishing community thought of these efforts as anything more than frivolous recollections of a juvenile pursuit there were no normal writing and editing standards applied. The mostly novice authors who first explored rock’s history ignored all accepted research protocol that other more serious histories demanded and simply used their own personal relationship in regards to their exposure to the music, thereby shifting rock’s “birth” forward five to eight years to when they collectively were first exposed to it, often through Freed, after which that became the accepted “truth” even though even a cursory look back to 1947 invalidates that view entirely. Whether you want to call such actions deliberately nefarious or merely circumstantial laziness, the fact is their actions had a monumental effect on how everyone since has come to learn about rock history. But as much as we’d like to spend two thousand words taking to task the original perpetrators of this mythology, not to mention the generations that followed who accepted it at face value and spread the misconceptions even further, it’s far better to simply go back to the beginning – as we’ve done here on Spontaneous Lunacy – and simply show, song by song, how rock ‘n’ roll ACTUALLY evolved. All of which brings us to another key moment in its evolution at the end of April 1949 with the arrival on the scene of an artist who, while a minor figure in terms of output, was yet another living breathing example of how widespread the terminology in relation to the music had already gotten… long before Alan Freed or any of his listeners down the road even knew rock existed. 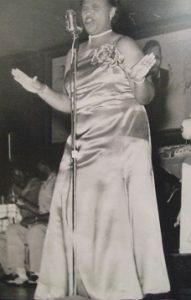 Like everyone else in New Orleans Erline Harris was well aware of the growing popularity of rock music in the late 1940’s. It’d be hard not to be aware of it actually. The music was now everywhere you looked in the Crescent City. Not only was rock ‘n’ roll born in New Orleans when Roy Brown cut Good Rocking Tonight back in 1947 at Cosimo Matassa’s J&M Studio but in the year and a half since no city had embraced it as wholeheartedly as New Orleans which had a huge black community in which music coursed through their veins like no place on earth. While many black communities across the country would only be able to hear these records if they bought them or found them on a jukebox, New Orleans featured one of the first black disc jockeys in Vernon “Dr. Daddy-O” Winslow whose daily show featured a steady stream of rock records which spread the sound and legitimized its importance. The city was also notorious for its countless nightclubs, an important component for rock’s growth as bands led by the likes of Paul Gayten and Dave Bartholomew got nightly exposure as well as instant feedback that helped shape rock’s direction. There were plenty of other local solo acts such as Cousin Joe, Smiley Lewis, Chubby Newsom and Annie Laurie who were ensconced in these clubs who had already released rock records of their own and thus attracted even more attention for the music when they headlined the shows. Nationally known names from other parts of the country, from Wynonie Harris to Joe Turner, came to town for extended residencies in these same clubs, all of which meant that there was never a lack of opportunity to hear rock music firsthand. Erline Harris was already 35 years old and had lived a full life by the time we first encounter her in this world. Distantly related to Louis Armstrong and previously engaged to Billy Eckstine, her pedigree was certainly not lacking when she found herself in New Orleans married to a well-known tap dancer Ike “Streamline” Harris. She’d been singing professionally for years (sandwiched around a college education no less) and so it wasn’t surprising when she and her husband began making a name for themselves as an act in local clubs. The same clubs that were smack dab in the middle of the rock ‘n’ roll maelstrom that was brewing. Taking a look around at the commotion this music caused and the enthusiasm it was met with she quickly added her name to the growing list of those throwing their fate in with rock music by writing the song which quickly became her calling card, Rock And Roll Blues. It would be that tune which got her noticed and quickly signed by DeLuxe Records, who’d already all but cornered the market on New Orleans rock ‘n’ roll, and it’d be that record which would mark her greatest claim to fame well into the next century. As for the contents of that record there can be no doubt that lyrically she shows she has a firm grasp on rock’s primary appeal, not to mention both meanings of the words themselves, both the sexual euphemism it often referred to and the broader sense of exhilaration that the music itself represented. Though hardly an eye-catcher physically she had a similar routine to fellow New Orleans sensation Chubby Newsom as Harris would shake her hips in rhythm to the song. She was a performer who demanded the full participation of the audience, whether dancing, singing along or merely letting go of their emotions and cutting loose in whatever crude or salacious manner they felt compelled to do in the heat of the moment. Harris is by the far the best aspect of Rock And Roll Blues, knowing precisely how to sell the suggestiveness without making it so over the top that it becomes a novelty. Her voice is strong, full and has a nice tone but more importantly she fully grasps the rhythmic aspects of the delivery, giving it the perception of impatiently surging along which helps to further sell the lyrics. Her vibrant chanting of the line “We’re gonna rock, we’re gonna roll” seven times at the start of the proceedings kicks this off with style, her shifts in emphasis coinciding with her increasing urgency for the payoff which comes in the first verses as she describes her man’s insatiable sexual appetite in a way that leaves nothing in doubt but still manages to pass muster with the censor. It’s such a confident reading that, like Newsom a few months earlier, you know both ladies had the requisite experience of which they speak as well as knowing full well the reaction their songs would elicit after months of honing it to perfection live. That road-testing of material as it’d come to be known in later years was often crucial in shaping a performance beyond what it might’ve started out as and while we can’t know the changes, if any, this underwent over time, we DO know that upon entering the studio in the winter of ’49 she had her role down pat and played it to the hilt. Unfortunately the same can not be said of the musicians who attempt to force Harris back into a chastity belt with their somewhat moldy playing. We were all hoping that the days of bemoaning the trumpet’s overbearing role in early rock arrangements was a thing of the past but here it is again making a mess of what otherwise was shaping up to be a brilliant record. The horn section is the millstone around Harris’s neck, the one attribute which probably costs her even more credit in regards to her role in rock’s rise to power when looking back over the years. Their presence alone gives this an uneasy footing, constantly in danger of betraying her intent to leave no doubt as to where she herself is aligned. Since that credit would’ve been lacking to begin with this is hardly a deficit she can afford when it comes to shaping her legacy. Though their enthusiasm in how they play tries its hardest to compensate for their ill-suited tones there’s only so much you can do to cover up the instruments inherent flaws. The trumpet’s squawking that runs behind her vocals for most of the record thankfully doesn’t get a spotlight of its own during the solo, as that role is taken by the far more appropriate saxophone, but even that is played with more modest aspirations, never acting as down and dirty as the material – lyrically and musically – would seem to call for. Yet Harris more than atones for this all by herself, never letting up on the throttle, imparting the underlying message with the knowledge of someone who had lived it and effectively conveying that to the listener without the need for over-the-top gaudy displays. When the same repetitive chant that opened the record closes it you’ve felt as though you’ve been taken for a spin around the block by somebody who knows all its corners and is friends with all of the colorful characters who congregate on the sidewalks you pass along the way. DeLuxe Records was going through a tumultuous time which would soon end its reign as the de facto New Orleans-centric label (though it was based in New Jersey.) Having sold a controlling interest to King Record’s Syd Nathan only to see Nathan aggressively look to take it over completely, Jules and David Braun were forced out of the company they started which itself had started rock ‘n’ roll as a commercial entity. Maybe it’s fitting that one of the last sides they were associated with was named Rock And Roll Blues. In spite of the behind the scenes machinations the record was pretty damn successful for an unknown artist on an independent label, selling over ten thousand copies and making Cash Box’s regional charts in Atlanta and Jacksonville as well as hitting the Top Five in Los Angeles, even though it was kept from the still small national charts in Billboard. When Harris’s next records came out they were on the Braun brothers new imprint, Regal Records and she remained a popular attraction in New Orleans, regularly appearing on Winslow’s “Dr. Daddy-O” radio program during this time and singing rock music with the same infectious sass she first showed here. In the end that might be the most historically notable facet to her career, that Harris’s commitment to the music was such that her nickname, in fact her publicly credited moniker on record, was always Erline “Rock And Roll” Harris, another key piece of evidence to stubborn non-believers that rock music was indeed vibrantly alive and thriving in black America long before future historians would deign to acknowledge its existence. This is one case where the artist may have slipped through the historical cracks but the name she was known by and the music she helped to popularize needed no introduction, even in 1949, provided you were part of the community that gave birth to it and would sustain it for years to come. If you want to argue the chronology of the term “rock ‘n’ roll” you should be careful how you use all of its permutations. For example, you’ve used the terms rock and roll, rock ‘n’ roll, rock records, and rock music. How many of those terms are historically accurate for 1947 or 1949? Would Erline have said “I just cut a rock record?” Likewise, it’s my understanding that the term “rock ‘n’ roll” is associated with the music after it was discovered by white teenage audiences. Actually the term rock ‘n’ roll (and all of its clearly associated derivations), had been used in black America to describe this music from the very start in 1947, though of course as with anything it gradually became more widespread as the music’s popularity grew and the slight variations you refer to are just shifting colloquialisms that happen with most things. This record sounds like someone took Wild Bill Moore’s “We’re Gonna Rock” and added actual verses to it. Good call, I say. Unfortunately, the band here isn’t as adventurous as the gang supporting ol’ Wild Bill. This record could’ve also used some real percussion (drums, handclaps, etc). Thankfully, Erline’s a dynamic singer who carries this thing over the finish line with flair. Further, the crowd-like choir that appears toward the end was a great call. Leave a reply on "Erline “Rock And Roll” Harris: “Rock And Roll Blues”"